It all started as a multi-cultural platform and jam session led by a Russian born violinist Pavel Shalman. It involving musicians from all over the globe: India, Brazil, Macedonia, Nigeria, Ukraine, Venezuela, Bulgaria, Morocco, Trinidad and Tobago, Turkey, Hungary, Serbia, Georgia, Russia, Palestine, Tunisia, Bosnia and Austria, eventually leading up to the formation of the 7 piece band Global Groove LAB. The band gets its sound by breaking all the stylistic rules, using elements from the Balkans, Reggae, India, Africa, Latin America, Rock, Jazz, Pop and even Classical music. The texts are critical of society, political, but also about the finer things in life. 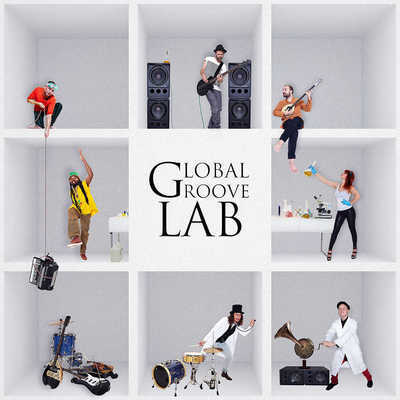 In 2016 Global Groove LAB released their debut album “I’m a Stranger”. Some of their highlights were Sunbeat Festival in Israel, Saalfelden Jazz Festival, a German tour, as well as many smaller festivals and concerts in Austria. The band was nominated for the Wiener Mut Award and last year also received a tour support grant from Musikfabrik Niederösterreich.